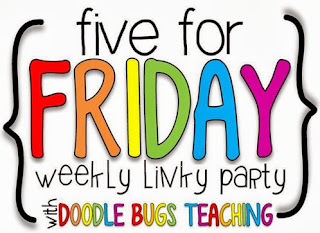 Finally getting back in to the swing of linking up with Kacey and Five for Friday.. EARLY! Yes, if you know me-- you know I am never early for anything. Heck, only 1 time out of 10 I am on time. Late, yes. Early, no. But here we are. Feeling good tonight. Here are my 5 randoms of the week! 1. Before you call me a bad mom, let me explain. 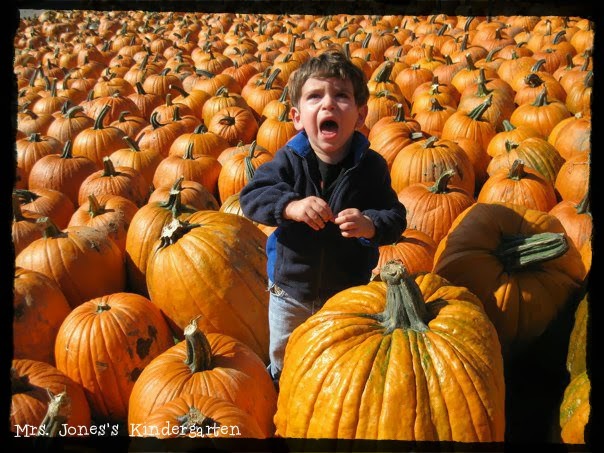 This is our son Brady, a few years ago when we went for a joyous family trip to the pumpkin farm. We thought it would be a cute photo op, no? So he was NOT a fan of the pumpkins. I had to snap the pic (don't lie, you would do the same). In case you were wondering, he's 5 now and is no longer terrified of big round vegetables. Halloween writing prompt anyone? hehe. 2. 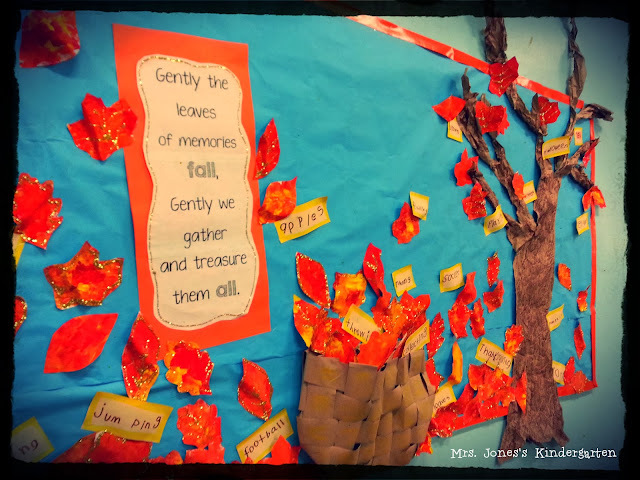 A week or so ago, I took down this bulletin board to get ready for fall -- but needed to snap a quick pic and give some credit. The idea is from my friend Vicky, and you can find her Back to School, or End of the Year craftivity here. So sweet, isn't it!? 3. Pinterest is renewing my obsession with all things pumpkin. Here is my fall ideas board-- lots of fun decorating ideas, crafts, etc. 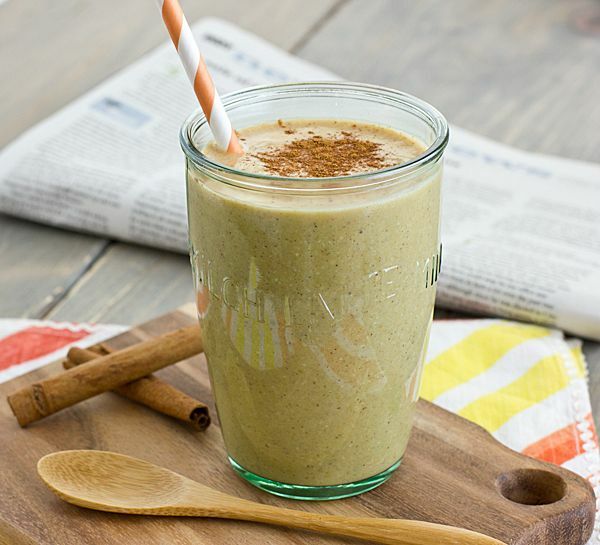 Does anyone else feel so many pinterest ideas so LITTLE TIME!? 4. 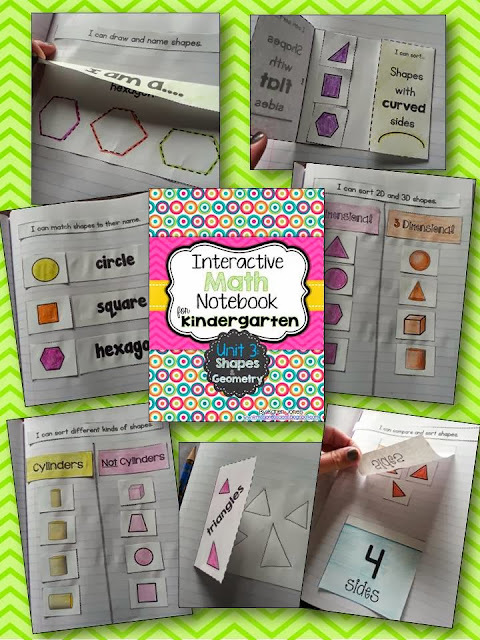 Shameless product plug ahead: My kids are seriously LOVING our Kindergarten Interactive Math Notebooks. Kindergarten is hard because their itty bitty hands are just not ready for all the fancy origami-style foldables yet. These are have been working great as a quick teaching point or review to start our regular math lesson. And the kids each chose a word to write for our bulletin board. We also had lots of fun sponge painting and glittering fall leaves. 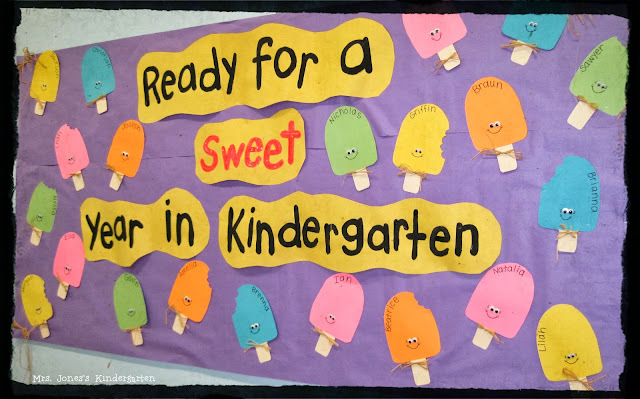 Karen, I love that math notebook and that gorgeous fall bulletin board! That basket is awesome! Oh my goodness, I totally would have taken that picture in the pumpkins. You will be so glad you did. :) Have a great weekend! PS I am your newest follower! :) I am so glad I found your blog! 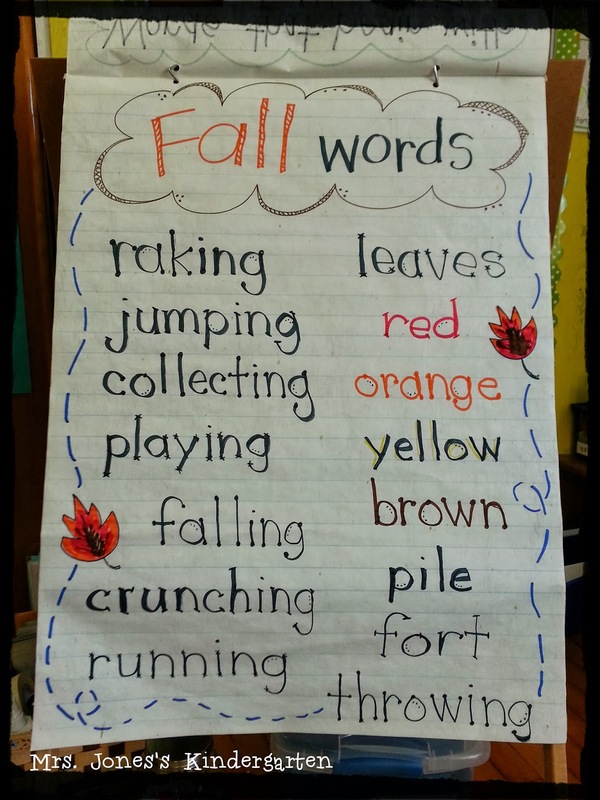 I love your fall leaves chart. We are introducing the inflectional ending -ing next week. Thanks for the inspiration. I will be pinning it. The picture of your son is so funny! Glad I found your blog. Karen - that pic of your son is hilarious! I'm glad you took it though to have as a memory. When my daughter was little she was crazy in love with ELMO so logically I took her to all the ELMO shows I could find...ELMO live, ELMO on ice etc....oh my goodness - when we had a meet and greet she was literally screaming when she saw him up close and personal...too funny! Cute board too btw. Expose yourself to your deepest fear; after that, fear has no power, and the fear of freedom shrinks and vanishes. You are free. See the link below for more info.